The importance of a good and neat handwriting is obvious. 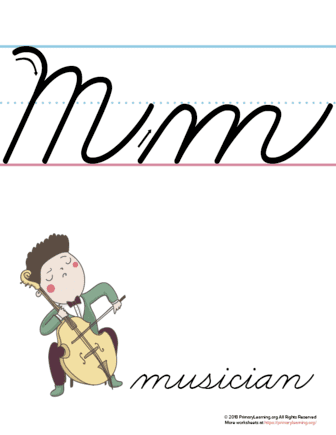 Use The Letter M in Cursive Poster for instructing students on proper letter formation. It is a great visual tool that helps students understand how letter is placed on the lines. Once they memorize it, it becomes for them to write neatly. Lamination is recommended for durability. This worksheet is designed in Zaner-Bloser Style.